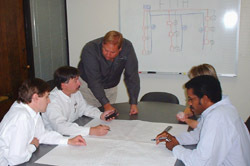 Project Management: Peregrine maintains a full staff of Project Managers with thorough knowledge of techniques to keep the customer informed on the progress and ensure timely completion of all Telecommunications projects. We can manage all projects including headend builds and outside plant construction and upgrades. Our Project Managers tailor their methods to best suit the customer including web based tracking of the project, regularly scheduled meetings and progress reports. Headend Consolidation: Aside from building state-of-the-art headends, Peregrine is also staffed with Project Managers and Field Engineers that can help systems seamlessly transition from multiple headends to centrally located master headends with minimal down-time. Peregrine also uses the same care and precision in hubsite implementation as we do with complete headend facilities. Network Specifications: Peregrine staff includes a design and engineering team that remains up to date with different architectural schemes from HFC systems to Fiber to the Home/Business and can customize a pathway for each customer. Unlike most engineering firms Peregrine has actually designed and implemented FTTH architectures using a variety of vendor solutions. Spares Analysis: Peregrine engineers understand the reliability requirements of our customer�s networks and can make recommendations on �hot� backup schemes and on the shelf spare equipment needs. Market Research/Feasibility Studies: Peregrine has been in the communications industry for over 20 years. Fully staffed with employees that all have an operations background allows us to understand the evolving market and provide a full operations schedule including budgets and marketing opportunities. Whether you are contemplating a new system overbuild or are committed to providing current customers a more advanced network Peregrine will provide expert leadership in the decisions that need to be made to make the venture successful. RFP Preparation: Peregrine will work with your system personnel to completely understand the goals of the project and tailor a �Request for Proposal� that will ensure success. Peregrine engineers will use their expertise and experience to analyze and make recommendations on the submitted RFPs. Upgrade Evaluations: Peregrine will use in-house design engineers and outside plant test engineers to evaluate the state of your network and determine migration paths for future upgrades. Product Evaluation: Peregrine�s facility in Golden, CO maintains a full test facility in which products can be evaluated. As a full service company Peregrine also has strong ties to the telecommunications vendors and can arrange testing and verification at their location. 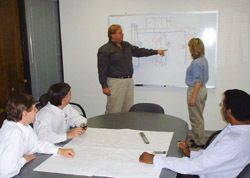 Training: Peregrine engineers are fully versed in all products and services that we provide and therefore have the expertise to provide a custom training plan on all items. In some cases Peregrine works with the vendors to supply additional training either at the customer location or at a vendor training facility. Architecture: Peregrine staff includes and a design and engineering team that remains up to date with different architectural schemes from HFC systems to Fiber to the Home/Business and can customize a pathway for each customer. Unlike most engineering firms Peregrine has actually designed and implemented FTTH architectures using a variety of vendor solutions. Headend/Hub: Peregrine�s Engineers will design custom headends and hubsites that will meet today�s needs and allow for expansion. 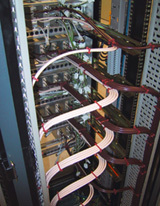 Headend designs include full facial drawings and in-depth wiring schematics that make it easy to troubleshoot and expand. Building Power/Environmental Control: Peregrine Engineers will develop a �needs analysis� to provide an accurate design of power comsumption and air handling requirements of equipment used in the headend. Fiber/Wire Management: Peregrine will design and implement a fiber/wire management system tailored to the headend that will allow easy additions of cables and channels, and provide ease to troubleshooting. Fiber Backbone: Unsure of long term plans? Peregrine will design a fiber backbone that can be built upon and provide alternative revenue sources. Factors such as future growth and business service opportunities will be considered so the backbone is ready for the unforeseen future. HFC/SONET/ATM/LAN/WAN: Peregrine employs engineers that are qualified and certified in data network design and implementation. Peregrine will design a data overlay that will integrate with the current network to allow extra revenue sources to be deployed. Digital Video Transport Systems: We will design and implement a digital video transport system that will allow headend consolidation. This design will help you sell your headend signals to neighboring systems, increasing your subscriber counts and revenue opportunities. Monitoring and Control Systems: Peregrine will design and implement a monitoring and control system for all of your outside plant and headend equipment. 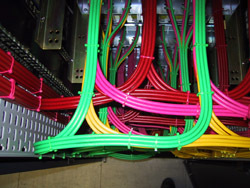 The system can be centralized around a Network Operations Center or as a integral part of a headend. SCADA (Supervisory Control and Data Acquisition) has become a vital part of today�s modern network design. Using various advance programs, Peregrine provides our customers with simple point-and-click technique�s to keep ahead of most system and or equipment trouble points. Engineering design, support and installation of today�s Graphical User Interface applications using SCADA software are available through Peregrine Communications, Inc.
Addressability: Peregrine will design and implement an analog or digital addressability system customized to the network in place. The addressability system can be a interdiction type system, an analog scrambling system, or a digital control system including conditional access. HFC Return Plant: Peregrine will design and implement a reverse plant system customized to the performance of the system�s outside plant and the goals of the network operator. Forward and Reverse Combiners: We will design a forward and reverse system that can be used to target subscribers for individual services, provide ad insertion to system selectable groups within the serving area, and provide the optimum performance of two way services. Emergency Alert Systems (EAS): Due to recent regulation changes, all systems must now implement an EAS system. Peregrine will design a system, using the best technology available on the market, that will cost effectively meet the new regulation and provide the local community a notification in emergency situations. Audio/Video Switching: Peregrine will design and integrate a switching or routing system that will make testing, signal insertion and back-up video switching easy and affordable. 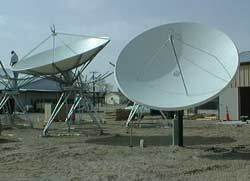 Satellite Antenna Farms/Towers: Peregrine engineers will design and layout a satellite farm and tower site that will maximize the signal reception while considering the limit of the land available. This design will use on-site testing as its basis if necessary. Peregrine will also provide a design of a transport system if the headend and reception location are not at the same site. Once the design is complete Peregrine is fully capable of constructing the site for you as well! Ad Insertion: Ad insertion accounts for up to 30% of the revenue in most cable systems. Peregrine will design and implement an ad insertion system that will allow cable companies to take advantage of these revenue streams. Cable Modems: As an integrator Peregrine has the ability to design and implement a High Speed Data system that will be tailored to your system and customer requirements. Cable modem implementation is a great differentiator between competitive systems and is extremely cost effective! Factory Rackup and Assembly: Peregrine maintains a large warehouse and self controlled shipping system that allows us to build, turn-up and test all equipment at our site in Golden, CO and safely ship it to your location. Progress on these types of builds can be tracked and viewed on a secure and password protected web-site. 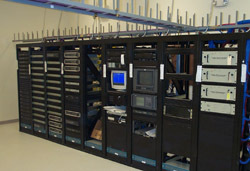 Headend/Hubsite Hardware and Wiring: Peregrine Communications prides itself on providing �turn-key� installations. We have combined the strongest relationships with a wide number of equipment vendors including Scientific Atlanta, ADC, Alpha Technologies, Motorola, and Blonder Tongue with a staff that is predominately engineers to provide our customers with a solution that is sound in design, built with reliable and high quality components, and installed with precision. Optical Network Hardware: Peregrine�s staff will install all of your optical network components including transmitters, receivers, (D)WDM splitters, fiber management systems, outside plant management enclosures and nodes. 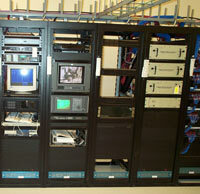 Activation and Testing: Peregrine will activate and test your system including outside plant and headend equipment. Peregrine�s staff is fully equipped with the latest test equipment and will provide accurate set-up and testing of your network components. EAS, Ad Insertion Systems: Peregrine will install and/or seamlessly integrate new services such as EAS and Ad insertion systems into your headend, including adding recombining schemes to make the transition successful. Monitor and Control Systems: Peregrine will design and implement a monitoring and control system for all of your outside plant and headend equipment. 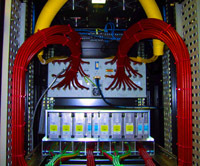 The system can be centralized around a Network Operations Center or as a integral part of a headend. 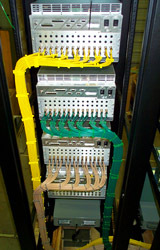 HFC Telephony Systems: Peregrine is an industry leader in design, installation, and support of HFC Telephony Networks. With over 10 systems installed and operational Peregrine has helped cable television companies begin to compete with the local exchange carriers. Data Applications: Peregrine employs engineers that are qualified and certified in data network design and implementation. Peregrine will design a data overlay that will integrate with the current network to allow extra revenue sources to be deployed. Addressability Systems: Peregrine will design and implement an analog or digital addressability system customized to the network in place. The addressability system can be a interdiction type system, an analog scrambling system, or a digital control system including conditional access. Audio/Video Switching Systems: Peregrine will design and integrate a switching or routing system that will make testing, signal insertion and back-up video switching easy and affordable. Satellite Antenna Farms / Off-Air Towers: Peregrine engineers will design and layout a satellite farm and tower site that will maximize the signal reception while considering the limit of the land available. This design will use on-site testing as its basis if necessary. Peregrine will also provide a design of a transport system if the headend and reception location are not at the same site. Once the design is complete Peregrine is fully capable of construction the site for you as well! Microwave Systems: Peregrine engineers will work with the industry leaders in microwave technologies to design and implement a system that will provide an alternative transport of signals where typical networks are not practical. Sweep Analysis: Peregrine staff will complete a regularly scheduled or one-time sweep and analysis of your networks forward and reverse systems. Whether for routine maintenance or to determine system upgrade options our sweep will allow accurate and timely information about your network. Certification Testing: Peregrine field engineers will certify your plant so that you are ensured that all new build activity is exceeding specifications when the system is launched. 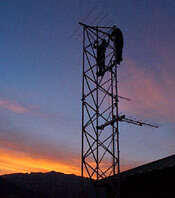 FCC Proofs: Peregrine will perform all FCC proofs including field tests and headend tests. A complete documentation package will be included that can be included in the public inspection files. Leakage Testing: Peregrine will ride-out 100% of you cable plant logging all leaks found. Peregrine can also provided technicians to repair leaks to ensure that all FCC requirements are met. Maintenance and Service Program: Cable Systems have long recognized that preventive maintenance programs greatly reduce trouble calls and keep your quality of service at a maximum, however it is usually the PM program that suffers in tight budget times. Peregrine will provided engineers and technicians to complete maintenance and service on your plant on your time schedule. We can be on-site continuously or on a regularly schedule interval. Technical Support Programs: Peregrine provides a one-stop shop to call for all technical support. Whether it�s outside plant equipment, headend gear, or advanced technologies such as high speed data and cable telephony, Peregrine engineers will be available 24x7 basis to help you through troubles. Our support packages can include on-site visits as well. Financing: In a budget crunch? Peregrine Communications can help. We provide financing options such as short and long term leases and extended terms. Web Site: Peregrine operates a secure web site where you can check the progress of your projects, view project notes. You are the keeper of the password so can control the access to your project information. Procurement: Peregrine operates a full warehouse facility and staff of purchasers. We can control purchasing and/or storage of all equipment. Materials Management: Along side of our procurement operations we also run a material management system that allows you to burden us with management of your required materials. Don�t be stuck without the equipment necessary to complete your project. Extended Warranty Program: Peregrine will extend the warranty on all equipment that you purchase from us. The typical CATV warranty time is 1 year, but we will extend that to the length of time that you choose. Regional Sales Offices with Committed Representatives: View our regional map and get the contact phone numbers here.